The utility displays the order book, as well as increases its depth, remembering the location of applications that have gone beyond the current "window" view. With the utility user can perform quick trading actions in one click - placing/cancelling/editing of explicit and hidden orders, and also opening/editing positions. Due to the specifics of the displayed data, the utility can not work as a trial version, and can not be tested in the strategy tester, for this purpose is a free indicator Smart Depth of Market . Symbol - trading symbol, if the parameter is not specified, the current trading symbol is used. EntryLot - lot, if the parameter is not specified, the lot will be calculated relative to the margin required for DepositPart. DepositPart - share of the trading deposit allowed for trading, is set as a percentage of deposit size. StopLossDistance - distance stop-loss in the ticks. TakeProfitDistance - distance take-profit in the ticks. PendingOrders - pending orders (as part of entry orders). Right - profile to the right of the utility price scale. Ticks - by number of ticks of history. Contracts - by deals of tape Time And Sales. Bottom - deals tape to the bottom of the order book. Both - both types of orders. DoubleVolumes - mode for high-precision volumes. Fixation - display mode: fixed or moving after the price. Smart - memory mode for orders that have gone beyond the view window. HideEntryArea - width of the area for hidden entry in ticks. MarketSlippage - allowed slippage for a direct deals in ticks. PendingSlippage - allowed slippage for a pending orders in ticks. TimeAndSalesTicks - number of ticks of deals tape. ProfileTicks - number of ticks in the profile history. ProfileDays - number of days in the profile history (value of zero means the beginning of the current day). RowsUnite - number of rows to unite. TitleFontSize - title font size. RowsFontSize - rows font size. TimeAndSalesFontSize - deals tape font size. MaxContract - fixing the scaling of rows length. MaxLengthPix - limit length of the volume row in pixels of the monitor. LeftShiftPix - shift the image to the left in pixels of the monitor. The orders book display works only on those trading symbols for which it is broadcast by the broker. To reset the information about the orders that were recorded in the Smart mode, switch the indicator to the Fixation mode and double-click on the orders book title. For currency pairs, as a rule, the deals tape is not translated, so the input variable ProfileCalculation must be switched to the Events position. In addition, it is desirable to use the input variable RowsUnite, which groups the rows by a specified number of pips (for example, five or ten). Hidden orders are not sent to the broker's server, but are stored directly in the utility's memory, and are triggered as direct deals at the touch of the declared price. Therefore, when using HideOrders modes, especially ExitType, a stable connection with the broker server is required. To the names of pending orders and open positions added the display of its tickets. User can disable the display of tickets by using the input variable ShowTickets. Fixed deviation of the rows when using function RowsUnite. 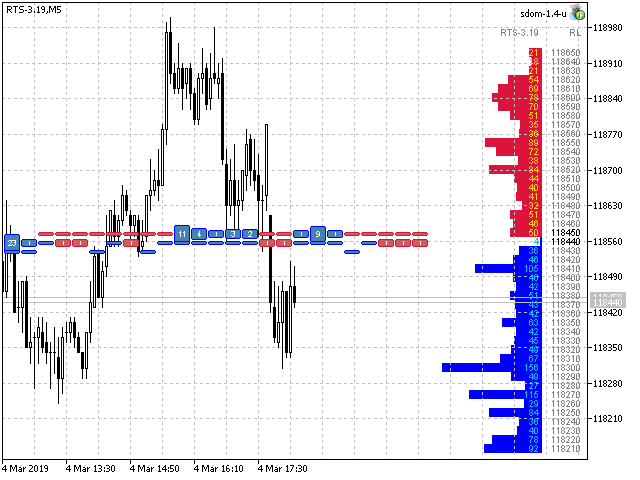 Fixed the error of incorrect location of the volume profile on the price axis of the orders book. 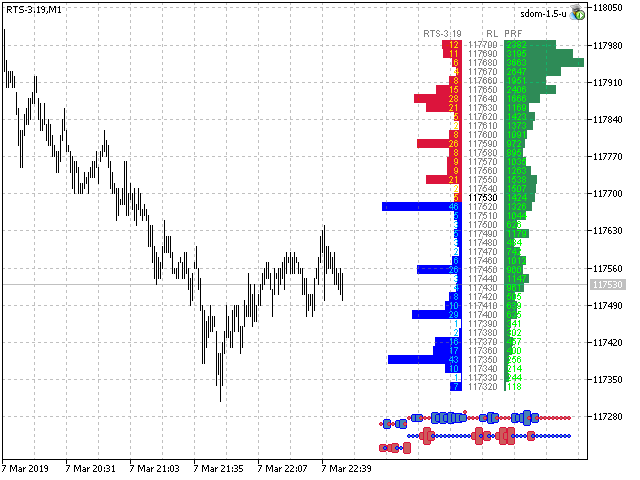 Added the function of restoring the stop-loss levels and the take-profit levels of pending orders when the mode ExitType switching from the state PendingOrders to the state HideOrders and back. 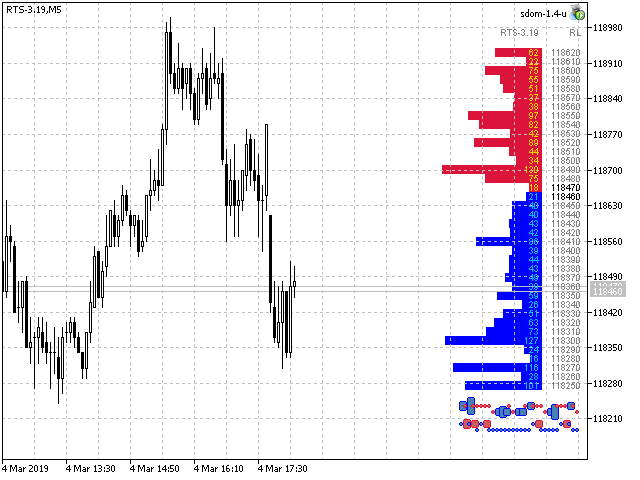 The levels of pending orders, as well as the levels of stop-loss and take-profit, can be moved with the mouse cursor. To move, select the level label and move it. Added function of the volume profile.